Microsoft Dynamics GP 10.0: You can't choose this document because it is part of a recovered batch or is still in the process of posting. "You can't choose this document because it is part of a recovered batch or is still in the process of posting." Well, my fast "stupid!" answer to this was "Go to batch recovery and recover your batch from there", but when I thought about it, it couldn't be un-posted if it was here to be applied! Are you tired of asking why is it that some transactions do post through GL and why some don't? Tired of changing the posting settings to no avail? This issue outta be one of the most confusing issues for users and consultants, new or seasoned alike. If you ever struggle with one issue in GP, please tell me it's this one, because even today, I cannot claim victory over this subject. So let's walk the walk together. 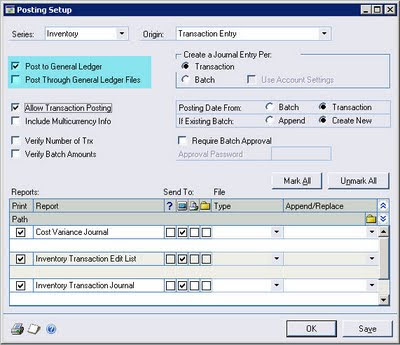 According to Part 3, Chapter 13, page 87 of the Microsoft Dynamics GP's System Setup guide, "If you mark the Post Through General Ledger Files option, batches posted in other modules automatically will update the module in which the transactions originated and the appropriate posting accounts in General Ledger. Your transactions will post to General Ledger and not through General Ledger when posting transaction individually (without a batch)." I recently developed an eConnect SOP integration that needed to import up to 40,000 orders a day into Dynamics GP from an e-commerce web site. At first this seemed like it might be a challenge due to the sheer order volume, but based on some tests I performed with sample data, I found that eConnect was able to import over 500 transactions per minute. This import speed would be more than adequate to handle 40,000 orders throughout a day. But, there was a second challenge. Although I could easily import 40,000 orders into GP throughout the day, the client would have to post those order batches in GP. And posting a SOP order in GP takes quite a bit longer than importing the orders using eConnect. Additionally, because the orders were coming from an existing operational system, they did not need to be reviewed in GP prior to posting, so there was no need for human review and manual posting. 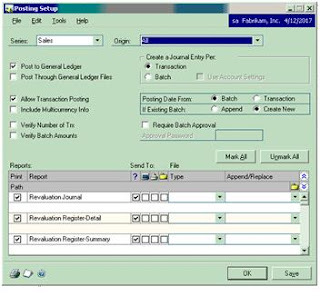 The main difference between these options is that when you Post To General Ledger, you have an extra opportunity to verify Batch transactions before they affect the General Ledger. When you Post Through General Ledger, you save time by not having to complete the additional verification step. We looked at Batch Posting vs. Transactional Posting last week. One of the benefits of batch posting is the ability to control the posting date via the batch posting date. This works for most batch types except GL. Many of you automating posting jobs have come across an issue with these schedulers: you are only allowed to output reports to the same physical file setup under your posting options. If you attempt to do this via Named Printers, the MDI writer will use a generic and all too cryptic 'NoteXXXX' file name that cannot be associated to anything coming from GP. Here's a little tip I learned long ago in GP training. Posting Settings can be a little confusing at times . . .
Post to General Ledger and Post Through General Ledger what is difference and which option should I used for my organisation ? In Posting setup (Tools--setup--Posting--Posting) Dynamics GP have two posting option for each series. When transaction are posted in subsidiary modules, the information should also update General Ledger accounts. 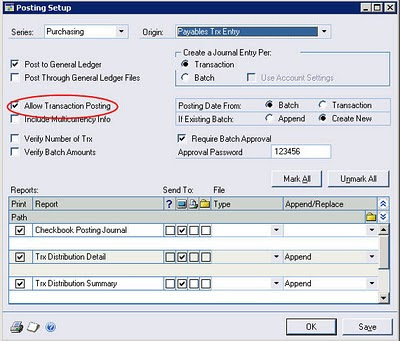 How and when this information flow to General Ledger is defined in Posting setup window. When an administrator sets up posting in Dynamics GP they get to choose whether to post to and/or through the GL. Posting To controls whether a transaction is even sent to the GL. Selecting the Posting To option means that a subledger posting updates the subledger and also sends an unposted transaction to the GL that then needs to be posted again to update the GL. 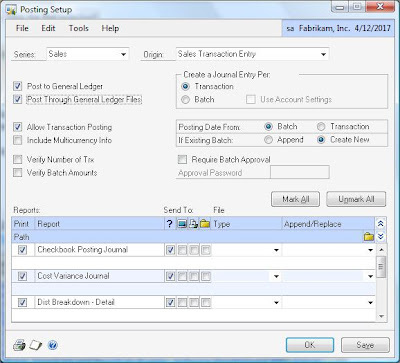 Adding posting through means that the GL portion of the transaction posts to the GL automatically as well. Posting Transactions that has document date in unopened period. Post Through GL is not working!?! ?